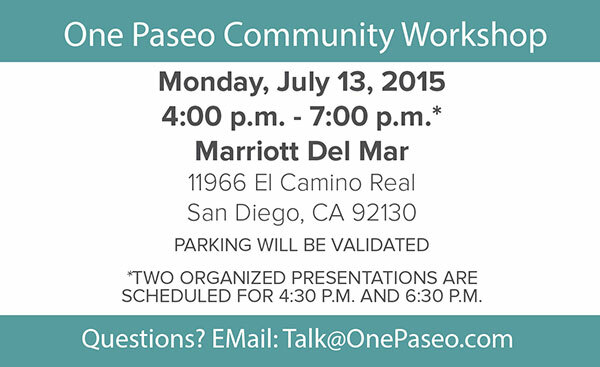 There will be a One Paseo Community Workshop on July 13, 2015 at the Marriott Del Mar on El Camino Real. Here is your chance to express your concerns and desires about a redesigned One Paseo project. Visit the workshop any time between 4:00 and 7:00 pm to review information, talk with the project team and provide feedback. The official flier (link here) reads: "Please join us at the One Paseo Community Workshop to have direct Q&A in small group and one-on-one settings with members of the Project Team in the areas of: traffic, community character, off-site improvements and more. Your input is important to us. Visit the workshop any time to review information, talk with the project team, participate in several interactive workstations, and provide feedback." Again, the event is on Monday, July 13, 2015 from 4:00 p.m. - 7:00 p.m. at the Marriott Del Mar (11966 El Camino Real.) It is more of an open house, so arrive any time and stay as long as you want. There will be TWO organized presentations, at 4:30 pm AND 6:30 pm (same information at both presentations, your choice of time.) Parking will be validated. Questions? EMail Talk@OnePaseo.com.